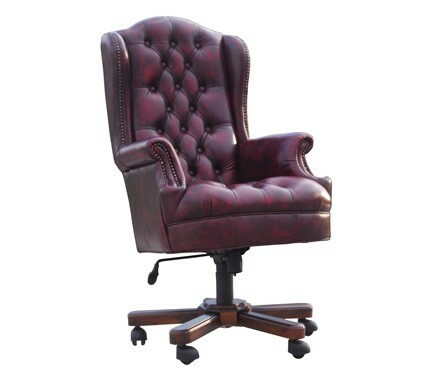 The leather chesterfield office chair will add a touch of class to any office or study. manufactured with a hardwood frame and swivel base this chair will match your beautiful desk admirably. The chair is fully buttoned, with feature studs across the top and the facings. The chair has a height adjustment and an adjustment to ensure it remains fixed in an upright position or can recline. The chesterfield chair is a high back which will give you plenty of support for your shoulders when spending time at your desk. Chesterfield swivel chairs are a combination of classic chesterfield style with the functionality of a swivel base. You could even match it with low back or high back chesterfield sofa in same colour. You can even choose your covering. 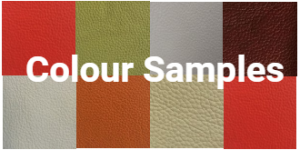 We have a selection of leather from the traditional washed off burgandy, washed off green and washed off brown, to solid colours. These solid colours include black, red, white, chocolate and many others. If you would like to add that very special touch you can also choose from semi aniline leather. These are available in a variety of tan colours and a few other tones. If you would like to look at a sample please contact us and we can email you. Our Chesterfields are also all available in fabric. Thats right! You can request a fabric or provide your own to match your decor. Chesterfield office chairs are found in many of the most successful and elaborate professional suites throughtout Australia. We have sold them to many offices that will match with a chesterfield chair, or a chesterfield sofa. If you have one of the popular mahogany desks you can match with a washed off burgandy chesterfield lounges couch. The washed off colours match beautifully with the grain of the timber desks. A chesterfield swivel chair can also be used as boradroom chairs. You choose the colour to match your boardroom. When you are purchasing you boardroom furntiure and chesterfield lounges contact us and we can send you a sample of leather to ensure there exists synergy between all your furniture. Have a look at our other chesterfield office chairs as well, maybe these style suit you better.